Adi Kumbeswarar Temple, Kumbakonam is a Hindu temple dedicated to the deity Shiva, located in the town of Kumbakonam in Tamil Nadu, India. Shiva is worshiped as Adi Kumbeswarar, and is represented by the lingam. 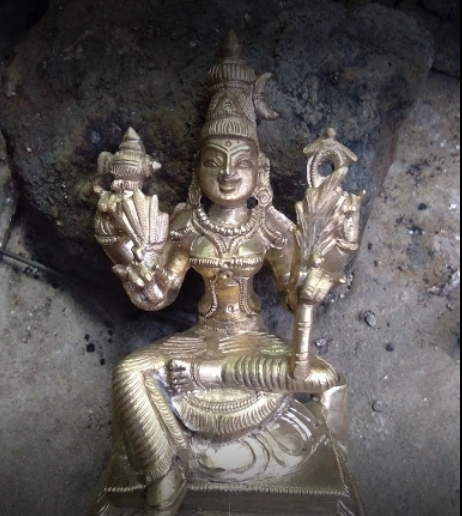 His consort Parvati is depicted as Mangalambigai Amman. 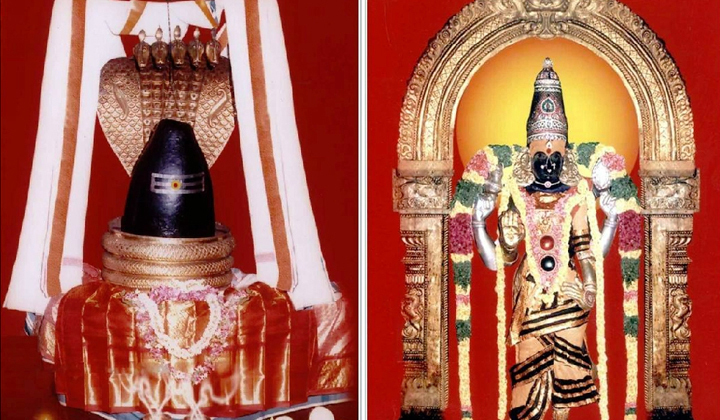 The presiding deity is revered in the 7th century Tamil Saiva canonical work, the Tevaram, written by Tamil saint poets known as the Nayanmars and classified as Paadal Petra Sthalam. Kumbeswarar temple complex covers an area of 30,181 sq ft (2,803.9 m2) and houses four gateway towers known as gopurams. The tallest is the eastern tower, with 11 stories and a height of 128 feet (39 m) The temple is approached by a corridor 330 ft (100 m) long and 15 ft (4.6 m) wide. There are five silver-plated chariots in the temple used to carry the temple deities during festive occasions. 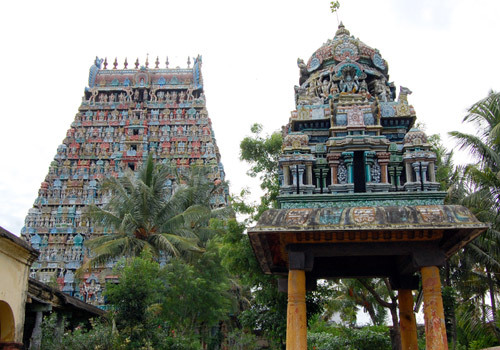 The temple is the largest Shiva temple of Kumbakonam and has a 9-storeyed rajagopuram (gateway tower) 125 ft tall It is spread over 4 acres in the centre of the town. The temple has 3 concentric compounds, elongated along an east-west axis has triple set of gopurams. Adi Kumbeswarar is the presiding deity of the temple and the shrine is located in the centre. Kumbeswarar is in the form a lingam believed to have been made by Shiva himself when he mixed nectar of immortality and sand. 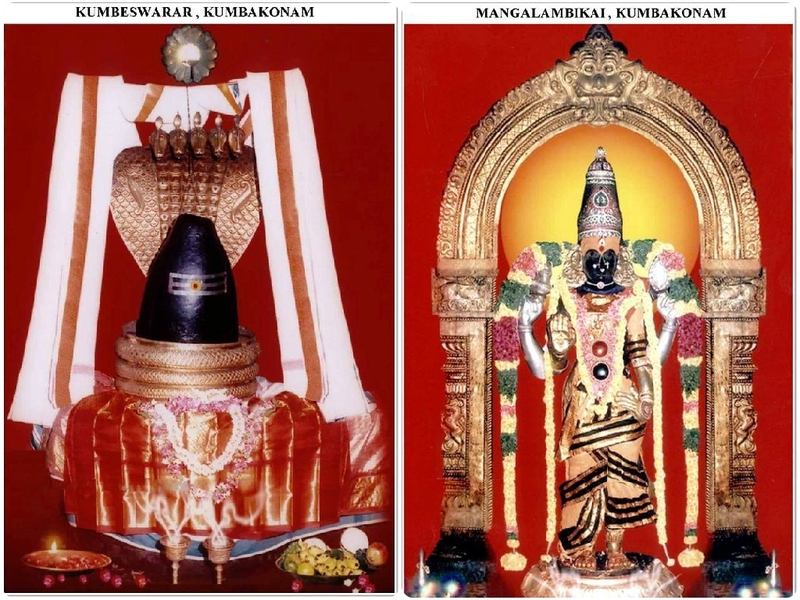 Manthrapeeteswari Mangalambika is his consort and her shrine is present parallel to the left of Kumbeswarar shrine. 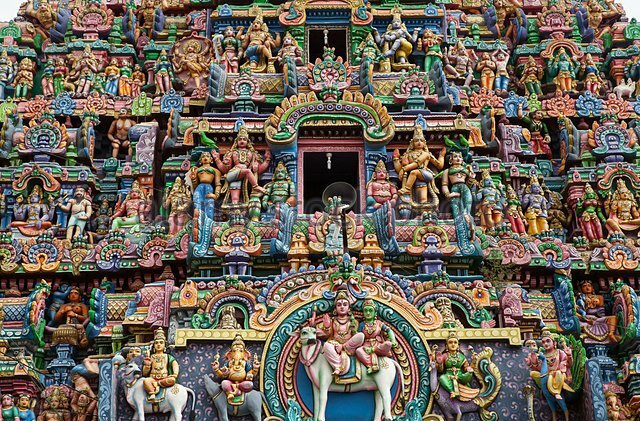 The temple has a colonnaded hall and a good collection of silver vahanas (sacred vehicles used to carry deities during festival processions) Beyond the flagstaff, a hallway whose columns feature painted brackets representing yali (a mythological creature) leads to the gopuram. The Navarathiri Mandapam (Hall of Navrathri celebration) has 27 stars and 12 rasis (constellations) carved in a single block. 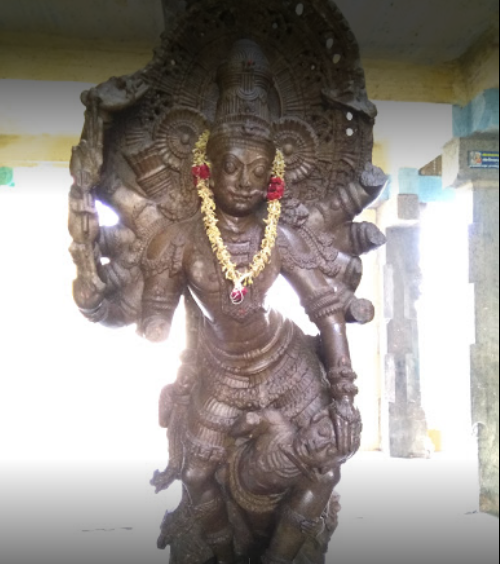 The idol of Subramanya having six hands instead of 12, stone nadaswarams (pipe instrument) and Kiratamurti are main attractions of the temple. The Mahamaham tank, Potramarai Tirtha, Varuna Tirtha, Kasyapa Tirtha, Chakkara Tirtha, Matanga Tirtha and Bhagavad Tirtha (bathing ghats along the river Cauvery) are the seven outlying water bodies associated with the temple. Mangala Kupam Asva, Naga tirtha, Kura tirtha are the three wells, while Chandra tirtha, Surya tirtha, Gautama tirtha and Varaha tirtha are the four tanks located inside the temple. 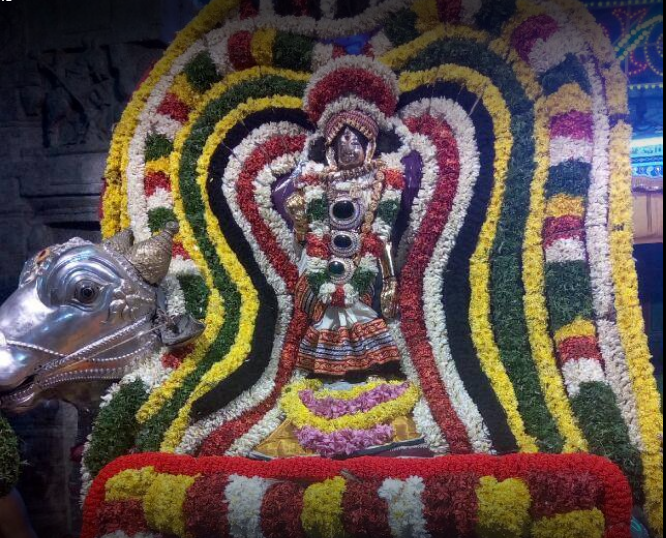 The Mahamaham festival takes place once every twelve years during the Tamil Month of Masi (February – March), when lakhs of pilgrims from various parts of India visit Kumbakonam to take a holy bath in the sacred Mahamaham tank which is located in the heart of the town. The festival has archaeological and epigrahical evidence. 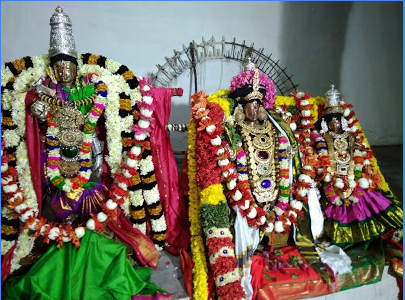 Tulapurushadaram, the practise of weighing oneself against gold and donating to the temple was effected by Govinda Dikshitar and the funds were utilised for funding the construction of the 16 mandapas around the tank. Krishnadeva Raya (1509–1529 CE) is believed to have witnessed the Mahamaham festival during this time. He made donations to the temple on this occasion is found in another inscription.